According to the Philippines’ Department of Social Welfare and Development (DSWD), the armed conflict that has put Marawi in crisis since 23 May 2017 has generated 359,680 internally displaced persons[IDPs] (as of 30 August). Currently, the government has issued Martial Law until the end of December throughout Mindanao. 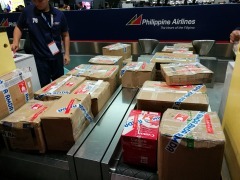 Having kept a close eye on the local situation from the onset of the strife, AMDA sent two personnel to the Philippines to discuss possible refugee assistance in late July. One of the two personnel was a Filipino national of Mindanao native who leads Okayama-Kurashiki Filipino Circle, a group of Filipino nationals residing in Okayama-Kurashiki area that aims to bridge Japan and the Philippines. The two made a courtesy visit to undersecretary to the office of Cabinet Secretary of the President of the Philippines, to brief the current situation on the ground. According to Ms. Mercado, 80% of the refugees have been evacuated to relatives’ residences while those who are staying at shelters account for only 20%. For the latter group, AMDA decided to organize a relief effort to help ease their prolonged evacuation life by providing a set of crayons, drawing paper and coloring book to children. In addition, medical supplies were donated to Amai Pakpak Medical Center (APMC), the main medical facility in Marawi. AMDA entered Mindanao on 02 August and visited APMC’s satellite office in Iligan City approximately 20 miles away from Marawi. Although scenery did not change much from the previous visit in March, there were more people and cars lining up at check points from the airport to an evacuation center. APMC transfered all the clerical work to the satellite office due to the worsened security in the area. After procuring relief goods on site, AMDA donated medical supplies to be used at partially operating APMC in Marawi, especially the medicine for surgical operation which was in short supply. After that, AMDA visited an evacuation center in Barangay Maya Christina run by APMC. There, a medical post was set up by the health ministry. It was functioning well with doctors, nurses and medical volunteers providing medical services. However, the living condition of the evacuees seemed to be poor as the building had a roof but no walls. The floor made with bare-concrete made the place cold at night as well. At the shelter, 1,082 people from 221 households had been taking refuge, including nine infants aged below six-month old. 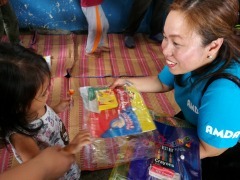 The said “drawing kit” was provided to 91 pre-school children who weren’t able to play outside. Immediately after receiving them, they joyously started drawing and coloring the book. Remaining 409 sets were handed to the health ministry’s regional office for further provision in other shelters. The kit will also be used in the art therapy organized by the ministry. A female evacuee said, “We had to leave immediately with our four-year old child and my family. We walked for one whole day from Marawi to Iligan. There is no privacy here due to the limited space allocated for each family. The daytime is humid but it gets cold at night which makes it hard for us to bear physically. We do receive canned food from the government, but you’d start to grow tired of it after a while. We sometimes trade the canned food for fresh fruits and vegetables but as there is no kitchen here, we basically cannot cook by ourselves. Still, I’ve been trying my best to cook even a little with the rice cooker we’ve managed to take out,” she said. The woman thanked AMDA for the children’s drawing kit. Being delight to see the children engrossed in it, “Kids love them!” she added. AMDA will continue to monitor the situation by keeping in close contact with its local counterparts, not to mention foreseeing the rehabilitation after the turmoil is contained.